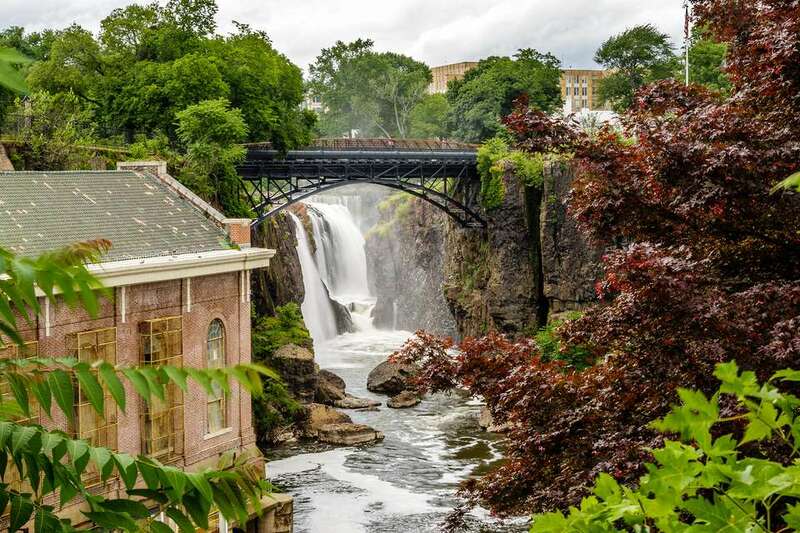 The Great Falls in Paterson, New Jersey is a 300-foot wide, 77-foot high waterfall that propels up to two billion gallons of water per day over its edge. While it's natural beauty is something to be revered, it is its history that has garnered it National Historic Park and Landmark status. As the nation's first Secretary of the Treasury, Alexander Hamilton took the first steps in securing America's economic independence in founding the Society for the Establishment of Useful Manufactures (S.U.M.) in 1791. In 1792, the Town of Paterson was established by the society, which saw the Great Falls as a remarkable power source for America's first planned industrial city. Hamilton enlisted Pierre L’Enfant, the architect and civil engineer who designed street layout plans for Washington D.C., to design the canals and raceways that would supply power to the watermills in town. Unfortunately, the society thought L'Enfant's specific ideas were too ambitious and replaced him with Peter Colt, who used a simple reservoir system to successfully flow water in a single raceway to the mills. Later, a system similar to L'Enfant's original plan was put into place after Colt's system developed problems. Due to the power, the Falls provided, Paterson can boast many industrial "firsts": the first water-powered cotton spinning mill in 1793, the first continuous roll paper in 1812, the Colt Revolver in 1836, Rogers Locomotive Works in 1837, and the Holland Submarine in 1878. In 1945, the S.U.M. 's assets were sold to the City of Paterson, and in 1971, the Great Falls Preservation and Development Corporation was established to protect and restore the historic raceways and mill buildings. You can find the 'oldest extant mill in the historic district', the Phoenix Mill, which was first a cotton mill and then a silk mill, at Van Houten and Cianci Streets in Paterson. On November 7, 2011, the Great Falls became the country's 397th national park and to this day, provides power to residents and businesses via the Great Falls power station. Installed in 1986, three vertical Kaplan turbine generators produce approximately 30 million kilowatt-hours of clean energy per year (source). Watch: "Smokestacks and Steeples: A Portrait of Paterson"
Want to see the Falls right now? Check out this awesome live webcam.